Sorry, August has been a busy month and I have fallen behind with our weekly blog, what follows is a quick review of the month’s happenings, 60 years ago. Visiting Midland last week, Miss Jill Edward of Sudbury found many things to interest her, especially around the harbour. 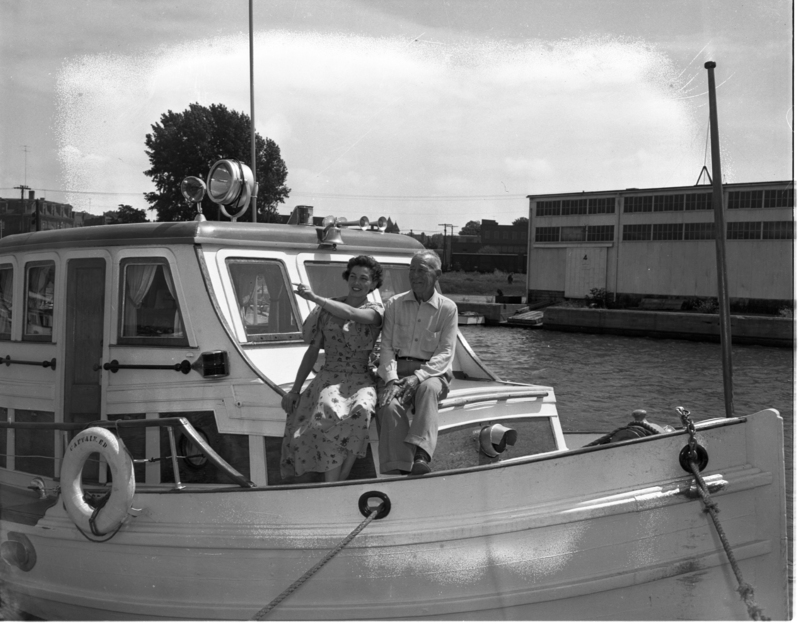 The deck of the yacht “Captain Ed” proved a good vantage point for Miss Edward and her uncle, Jack Wiggins. Miss Edward was a guest of her grandparents Mr. & Mrs. J. W. Preston, Elizabeth Street, during her visit. Ceremonies marking the end of the Ignatian year, highlighted events at the Martyr’s Shrine Sunday. 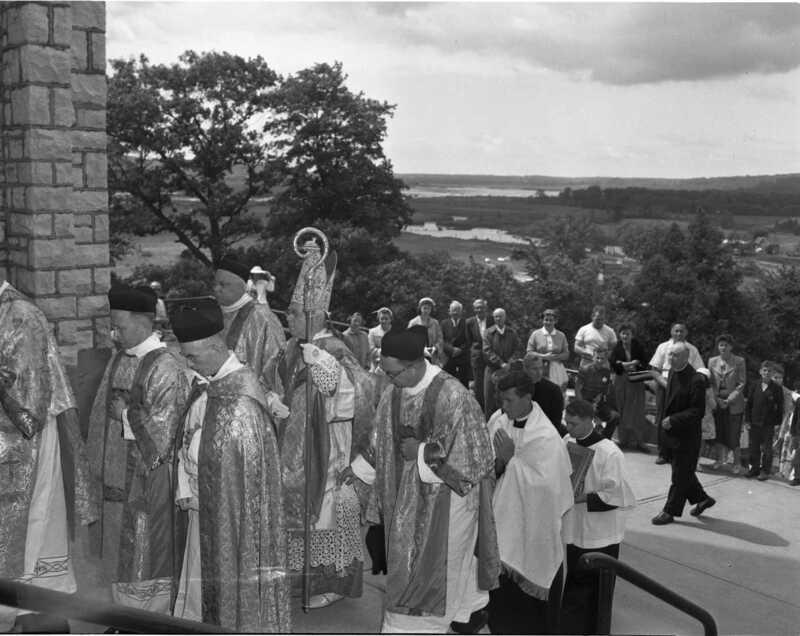 Among the many dignitaries was James Cardinal McCuigan seen in the center of the procession wearing his mitre and carrying the crozier. St. Ignatius founded the Jesuit Order with which the Martyr’s Shrine and Ste. Marie are linked. This old thread spool dispenser brings back memories for Carson Brown and William J. Edwards of Vasey. For many years it was one of the store fixtures of the 70 year old country store at Vasey purchased by Mr. Brown in 1945. Already replaced by a brand new store the old building is being torn down to clean up the property. 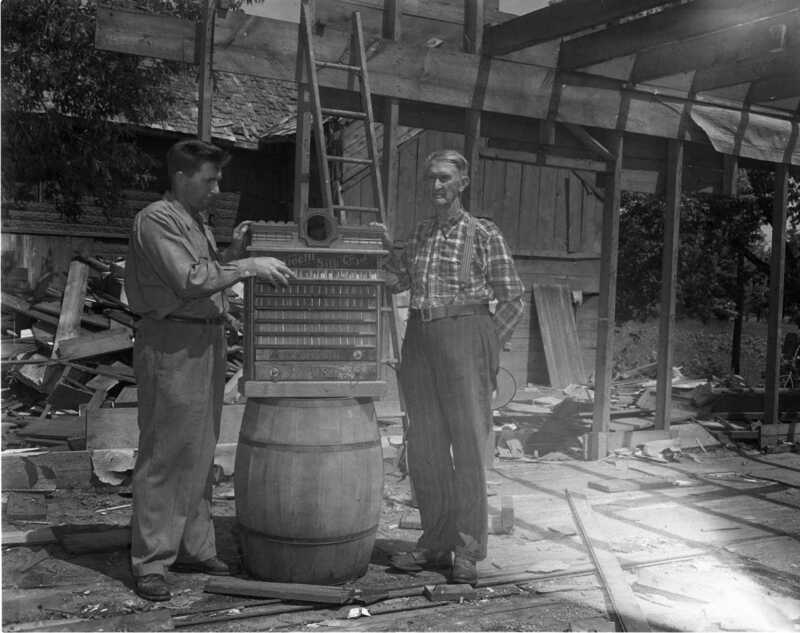 The spool dispenser and a few barrels are all that is left. 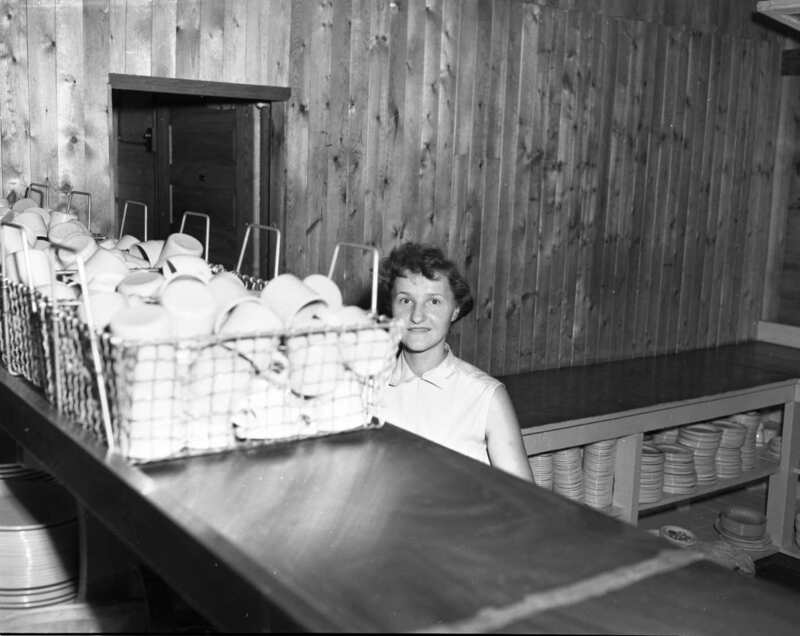 Not worried, smiles Camp Kitchikewana kitchen staffer Eva Koenig of Midland, she’s got the dishwasher. But she and six other workers still have a busy time feeding more than 200 campers and counsellors at the Midland YMCA camp on Beausoleil Island. 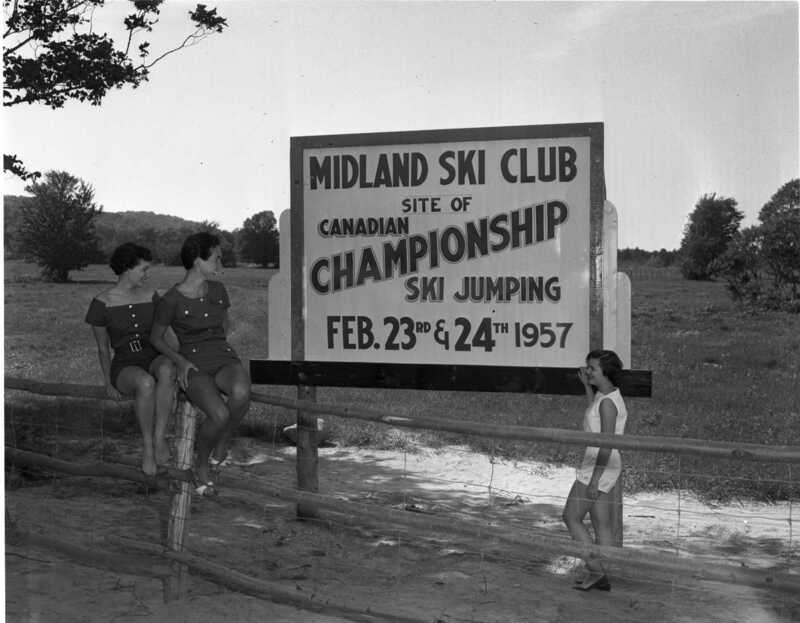 New sign erected near the base of the new ski jump hill at County Road 6 proclaims the Midland Ski Club, site of the Canadian Ski Jumping Championship, February 23rd and 24th, 1957. Joan Reid, Diann Flynn and Barbara Allsopp. Many individuals and groups have helped build a new home for Mrs. Amy Moreau in Victoria Harbour, whose husband died several months ago. Mr. Moreau had served the village as a councillor, fireman and village foreman. 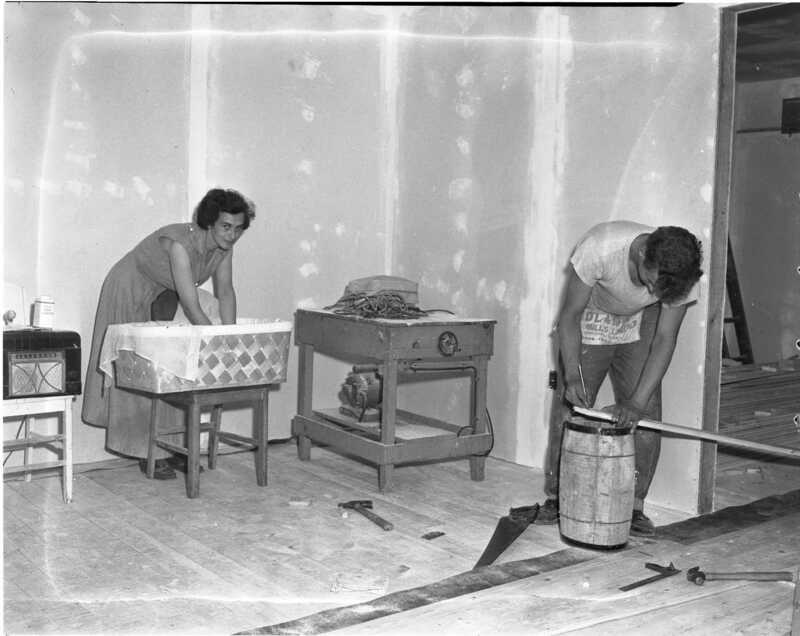 In this photo Mrs. Moreau tends 3 month old Roberta while cousin Bobby Moreau works on laying new flooring in the new five room home near the sub-station. Religious summer schools called “Good News Clubs” were held in Midland and Penetang last week and attracted more than 120 local youngsters. At Midland’s Nameplate Park a band has formed using instruments provided by the Child Evangelism Fellowship. 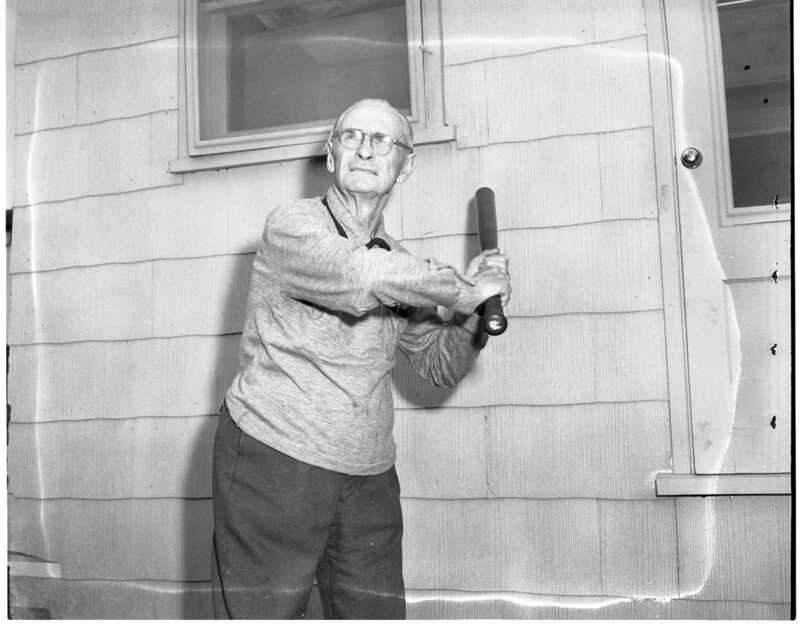 Midlander Fred McClung, now 82, captained the fabulous Hillsdale ball team in 1910 and will relive those days tonight when eight of the nine team members meet for a reunion and dinner in the village. Memories of games of the past came flooding back for these members of Hillsdale’s great ball team of 1910 gathered for a banquet in Hillsdale’s United Church Wednesday night. All but Lance Rumble in the white were regular members of the team. 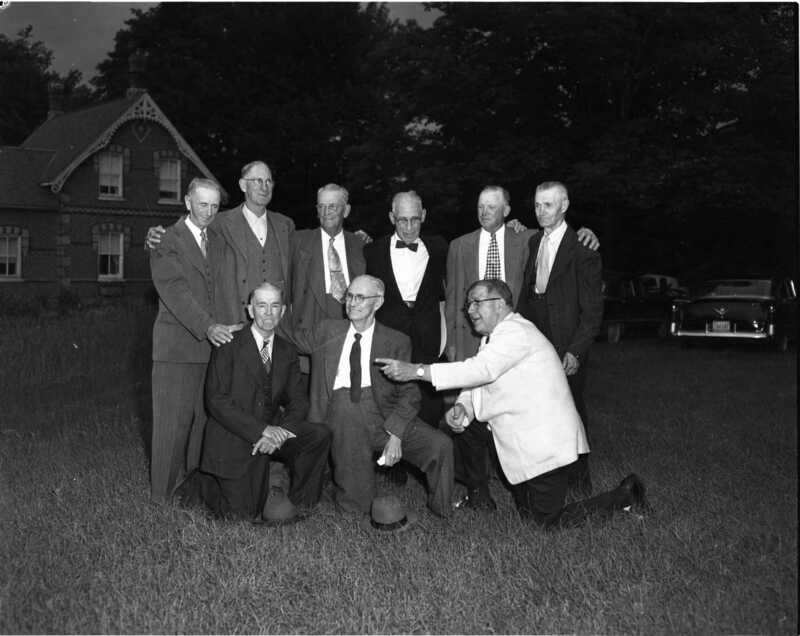 Front row, Joe Hutton, Fred McClung and Mr. Rumble; back row, Ed McClung, Gordon Hough, Ernie Scott, Bill Davenport, Fisher Ganton and Albert McAvoy. Only members missing were Lionel Shortreed and the late Art McDonald. Mr. & Mrs. Ben Wright of 11 (now 645) Quebec Street celebrate their golden wedding anniversary. On hand to help celebrate is Judy Lemieux one of their 21 grandchildren. 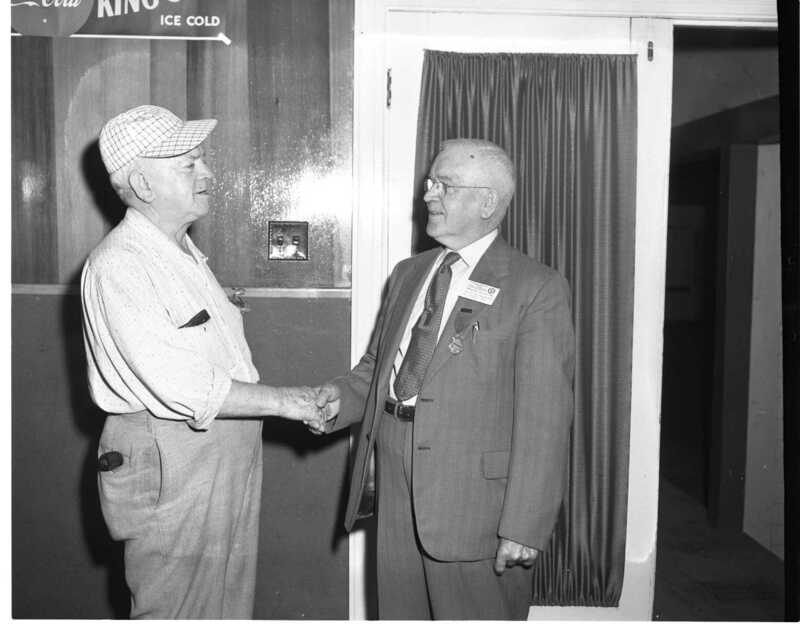 Mr. Wright who came to Midland in 1915, operated one of the province’s largest fish bait businesses for many years. 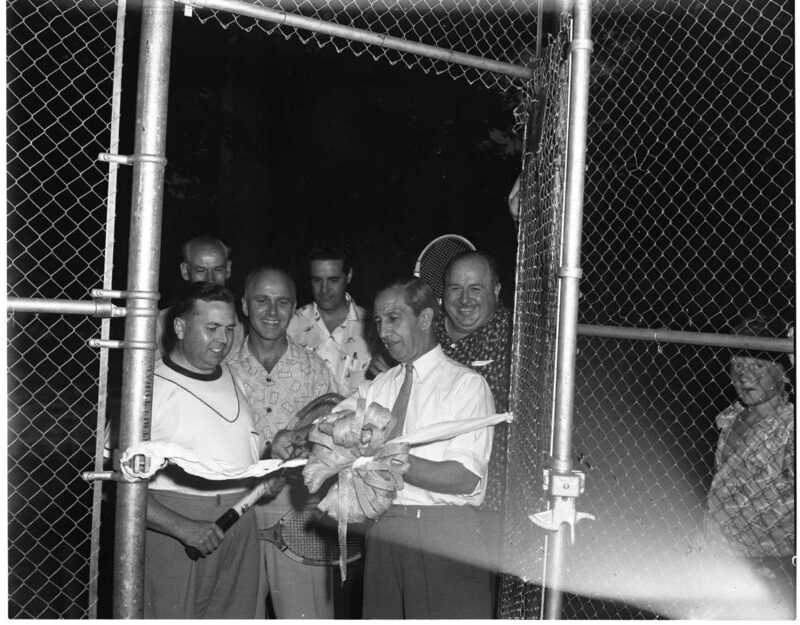 Parks commissioners John Burke, Gordon Boyd, Bill Beaton, Al Perkins and secretary Bill Hack watch Chairman William Murray cut the ribbon to open the new tennis courts behind the armory in Little Lake Park. 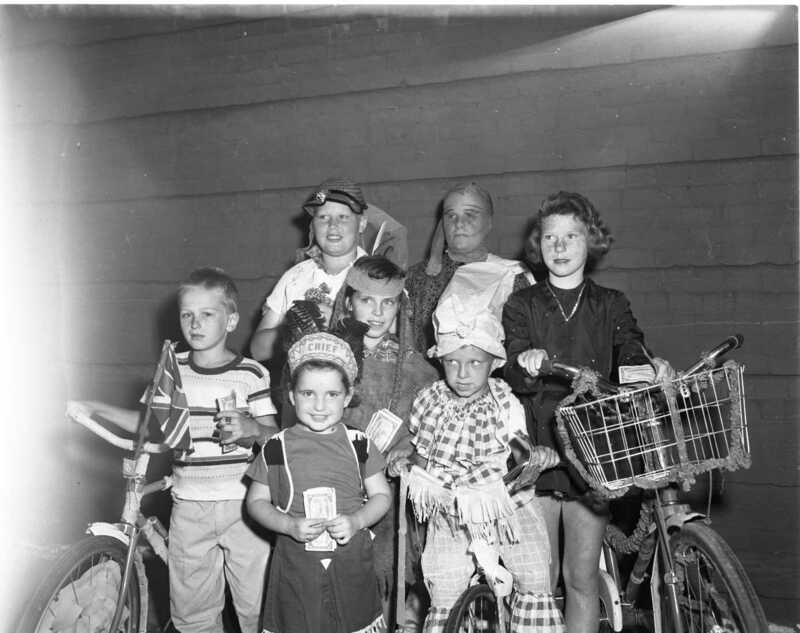 Costume prize winners at Legion Carnival Friday night are; front Elaine Onley, second row, Lenny Roach, Joan Ward, Billy Ward and Carol Scott; back row, Roger Parrish and Bjorn Pettersen. 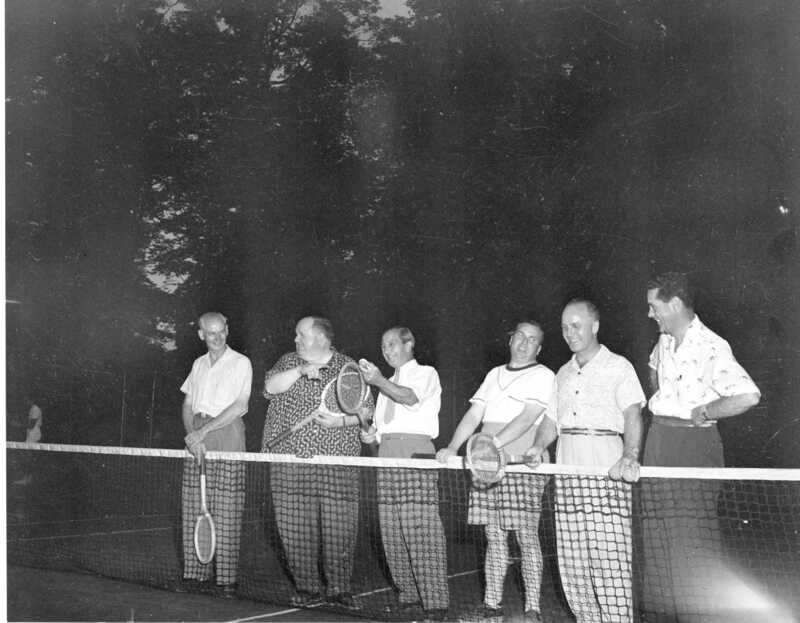 Judges were Mr. & Mrs. Bill Barnett, Wm. 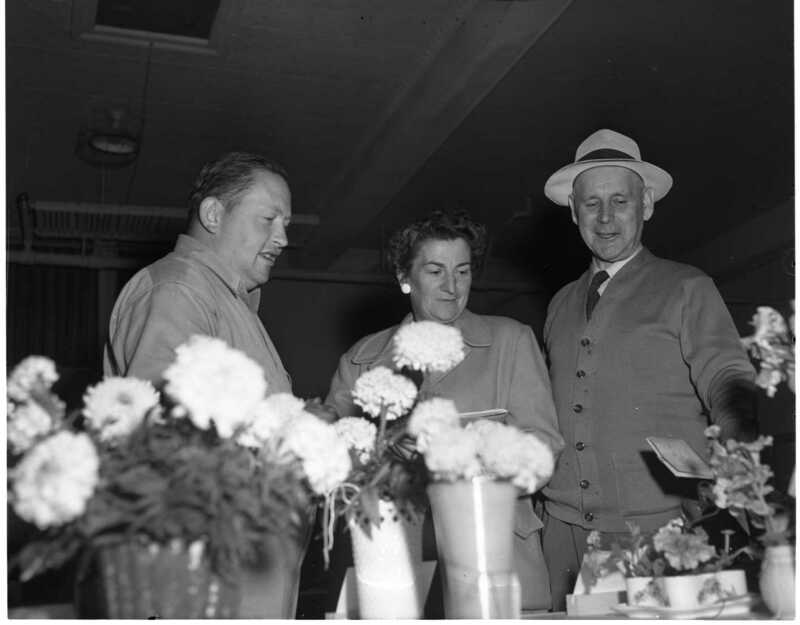 H. Keller, Charles Onley and J. J. Robins. 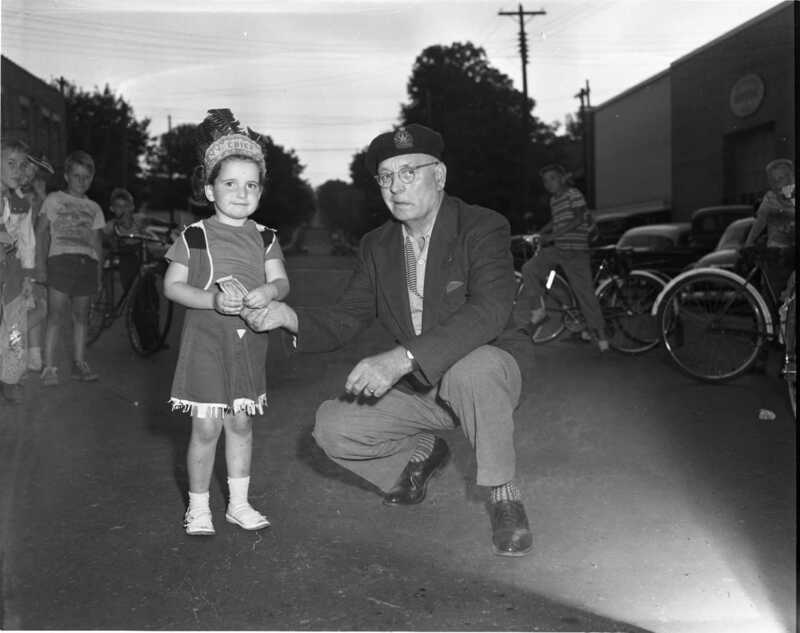 Elaine Onley receives her prize as best costumed 5-7 year old from Legionnaire Len Wiles who represents the sponsors of the Carnival, Midland Branch 80 Royal Canadian Legion. 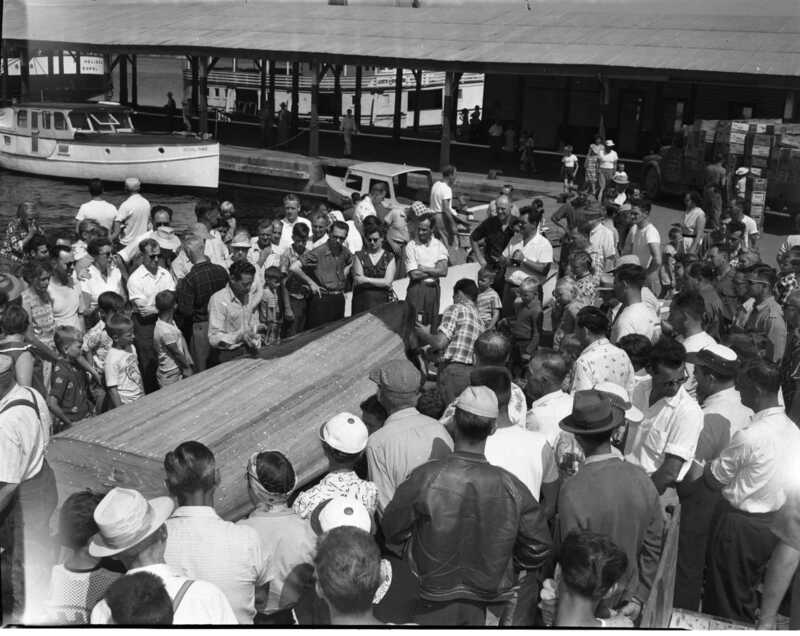 Do it yourselfers watch as employees of Midland Reinforced Plastics Ltd. coat an old 14 foot cedar strip boat with the first coat of resin before applying plastic cloth supplied by Midland’s Bay Mills. How to make an old boat new again? Fiberglas. The Crealock`s “Royal Ann” is in the background as is the “City of Dover”. A pop truck is re-supplying the Dover. Both tourists and residents complain there are too few spots and amenities at the government dock in Midland and that this is not encouraging cruising tourists to dock here. Ted Pearson, veteran Midland barber greets S. G. Chamberlain of Chatham who is the honorary president of the Canadian Bandmasters Association which held its convention in Midland over the weekend. Now 72, Mr. Chamberlain played in the Midland IOOF band with Ted more than 50 years ago. Ted Pearson started with the Town Band in 1906, which disbanded after a few years and Midland had no band until the Boys Band was formed after WW2. It has since become the Midland Citizens Band. 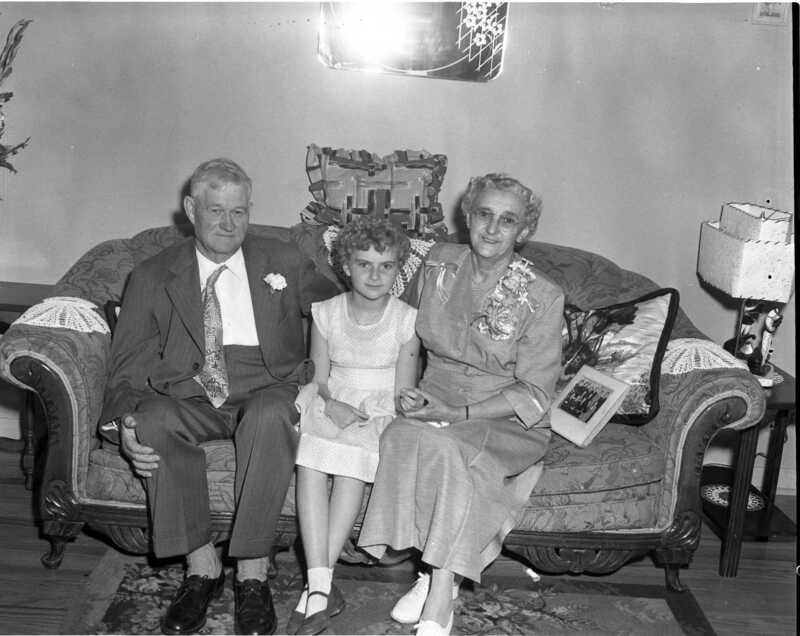 One of the first bandmasters was Jack Roberts, father of Mrs. Fred French. Scaffolding erected around Midland’s Post Office so that re-pointing can be done and removal of some heavy gabling. Local contractor Lloyd Murday expects the work to be done in three to four weeks. The Post Office was on the ground floor, Customs and Inland Revenue were on the second and there were quarters for the caretaker in the attic. 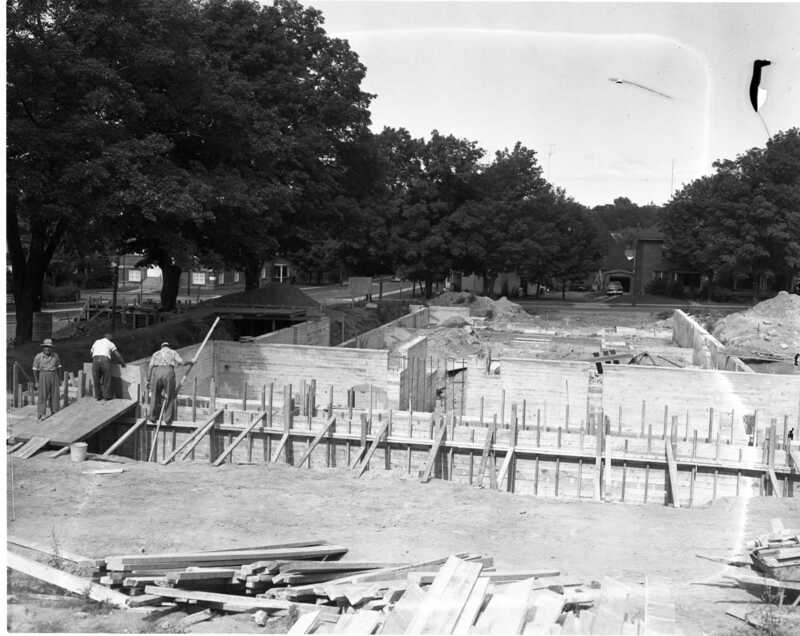 The contract for the construction of the building was let to Mr. E. A. Bleakeney of Ganonaque for $47,700.00 and it took 20 months to complete. 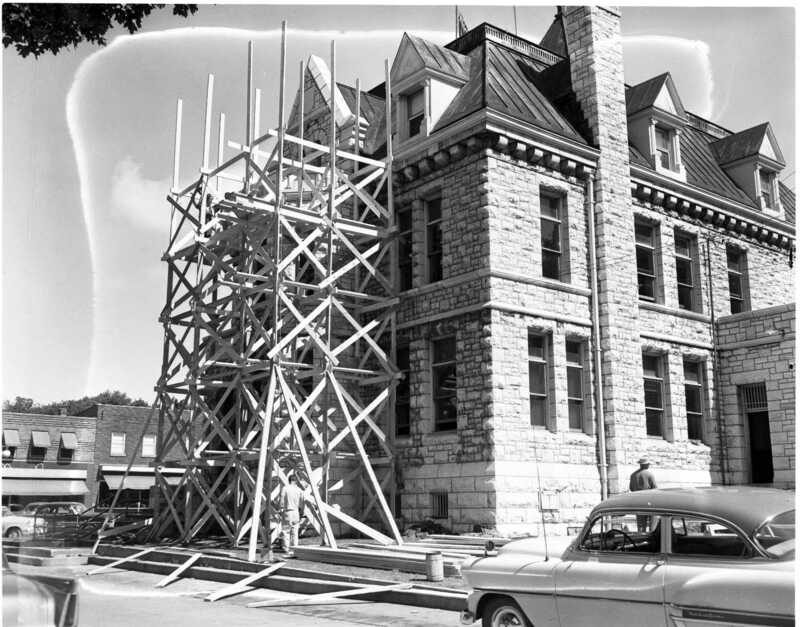 The building became the Midland Public Library in July of 1967 and was renovated again in the 1980’s and 90’s. An expansion was built in 2012. Work on the new municipal building in Midland is right on schedule despite some concerns caused by the shortage of concrete. Alfred Rei of Midland is the general contractor and the building should be ready by early December. The experts agree on the winner at the Midland Horticultural Society flower show held Friday at the Knox Presbyterian auditorium. Charles McElroy, society president, Miss Paulene McMullen and judge Harry Stainton. A. Gibson, 45, of London Ontario takes over as secretary-manager of the Midland Chamber of Commerce. Council and Midland’s police force reach two year agreement on wages and working conditions. It confirms the appointment of Patrol Sgt. George Wainman at an annual salary of $3,400, three officers at $3,300, and wages of two officers at $3,000. The men must purchase their own clothing. R. Y. Eaton, president of the T. Eaton Co. Ltd. for 20 years, died at 8:45 p.m. Saturday, in St. Andrew’s Hospital, Midland. Remember the Eastern Star penny sales, the names of the winners were listed in the paper. The recently re-opened Breithaupt Leather plant has shipped 25 tons of pickled hides from Penetang to its Campbellford plant for finishing. The plant employs seven men. 46 year old DeNure and Son Transport has been sold to Haslam Transportation of Hamilton. Peter Brasher, Bristol England, joins the medical practice of Dr. T. J. Johnston. Penetang Fire Brigade wins three first place trophies in the annual Ontario Fireman’s Association tournament in Port Colborne. Ball Bros. of Kitchener, the contractor who built the new MPDHS building, wins the contract to build a 150 cell addition to the Oak Ridges Ontario Hospital in Penetang. Work on the two million dollar addition is to begin in three weeks and will employ 200 men. Work has begun to lengthen and lower the base of the ski jump at the Midland Ski Club’s property. Pete Pettersen expects jump distances to increase by twenty feet. Miss Anna Magnus given highest honour by 38,000 member Federation of Women Teachers Association to be held at the Royal York in Toronto. 45 years of teaching, 34 of them in Penetang, she will be made an Honourary Member. Bay Mills and Textile Worker’s Union employ conciliator to end disputed contract. Main focus is the elimination of the 48 hour work week. New Trans-Canada Highway being built north of Waubaushene has started a boom in the sale of lakefront cottage property. Beausoleil Motors, proprietor J. R. Beausoleil, opens BA gas station at the corner of Bay & Second Streets. Ten Years Ago; Four nurses graduated from St. Andrew’s Hospital school of nursing, Mary Duncan, Phyliss Bernice Jennett, Doris Lapp and Bernice Laidlaw. 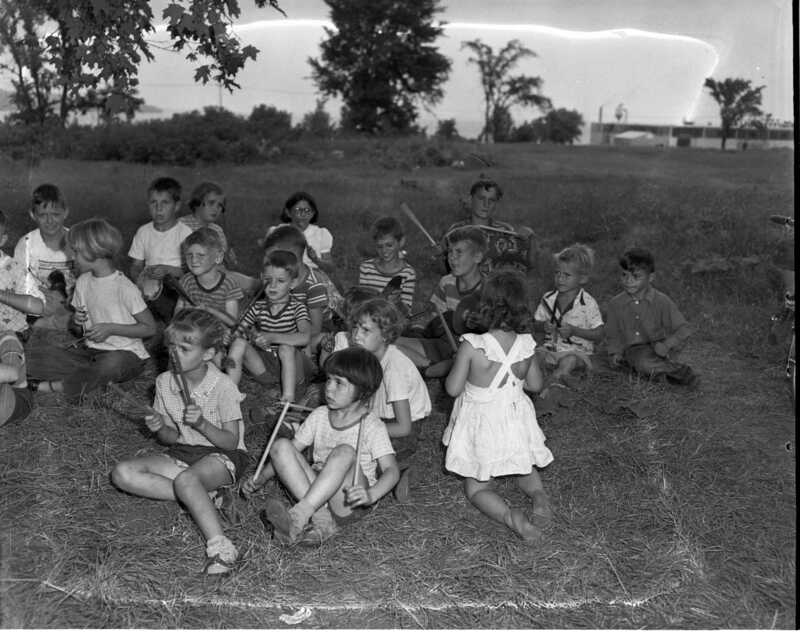 — Organized in the spring of 1946, the Midland Boy’s Band was preparing for its debut before the public at a concert in Little Lake Park. — Penetang’s Phil Marchildon pitched the Philadelphia Athletics to a 4-1 victory over Detroit. It was his ninth win of the year. 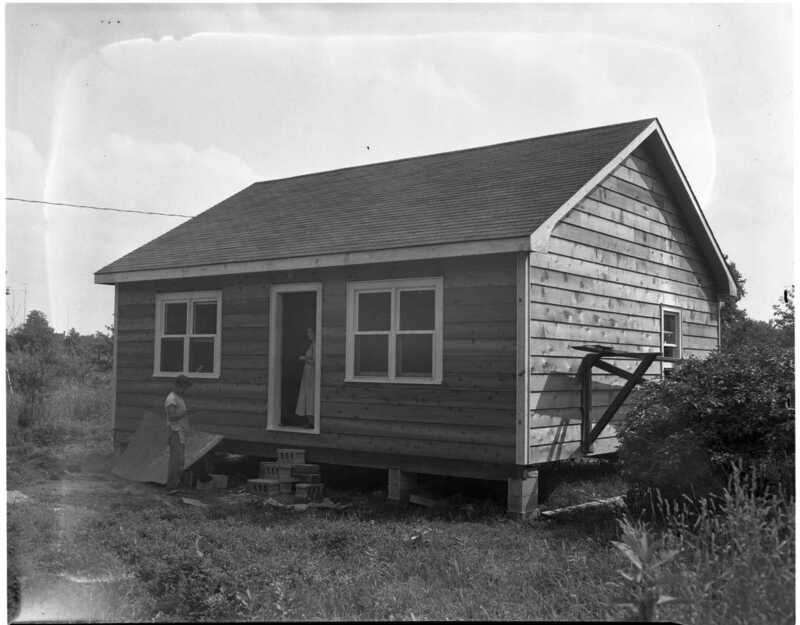 — St. Ignace ll, a Huron village of 1,200 was uncovered on the banks of the Sturgeon River about a mile south of Highway 12. — A new record was set at St. Andrew’s Hospital when Dr. D. C. Swan attended at the birth of five babies between the hours of 4 and 5 a. m. July 15th, 1946 — Arena Gardens was crowded to capacity when Canada’s Oscar Peterson and his trio came to town. One of the main attractions was the bass player, former Midlander Bert Brown. — An ex serviceman from Toronto, Bruce Armstrong purchased the “Porter House” hotel in Waubaushene. — Beck’s box factory in Penetang was forced to close due to a shortage of nails arising from a steel strike. Workmen began widening Main Street in Penetang north of Simcoe by removing the boulevards and curbs, new paving will be full width in the business section. Earlier in the month a vacationing woman at Six Mile Lake had been bitten by a rattlesnake she had picked up, mistaking it for a water snake. The paper had several articles declaring rattlesnake bites had never proven lethal, procedures to follow in the event of a bite and statistics showing how most bites were harmless. She died in Orillia hospital eight days after the bite. Brand new look for Parkview School in the fall. $10,000 has been spent on windows, paint, flooring and other repairs and maintenance over the summer. W. L. Weckman has been appointed director and general manager of Pillsbury of Canada Limited with headquarters in Midland. William H. Pinchin, former manager, became vice-president of Pillsbury Canada. The company operates four mills here and in Calgary. Percy Crawford, superintendent of construction at the new Simcoe County Old People’s Home in Penetang has unearthed what he estimates will be two to three hundred pounds of honey in the walls of the old hospital building being demolished. Trick will be to get by the swarm of bees, local keeper has been unsuccessful to date. Giuseppe “Joe” Tersigni retires after 44 years in the retail and wholesale business. Joe is simply closing his 15 Simcoe Street location and saying thank you. Knights of Columbus Hall on Poyntz Street is nearly completed. All summer, volunteers have worked evenings and weekends to complete the structure. The attached bowling alley will be open to the public. Free Press Herald again rated the nation’s best all-round weekly, first or second five times in the last seven competitions. Awarded the 1956 Mason Trophy. Editorial thanks editor Wils Harrison for being a big part of the success. New bridge over the Wye River west of Wyebridge was to be completed August the 15th, first pilings are just being driven now. Marilyn Monroe in the “Seven Year Itch” is playing at the Roxy. The poster shows that famous scene with the skirt. Tay Township police chief William Magnus has his police cruiser stolen. “Church in the Pines” at Cawaja Beach continues to draw one hundred or more worshippers during the summer months as it has for 30 years. New phone exchange overloaded, in operation only a few weeks the new exchange may already be too small. “There have been several occasions when the long distance volume was so great we could not keep up with it on our ten position board” said H. A. Kilroy, manager. Waggs Laundry and Midland Foundry and Machine receive Department of Defence contracts worth $35,000 and $15, 250 respectively. Fred Miller wishes to thank all the customers of his Supertest Station & Grill, Victoria Harbour. 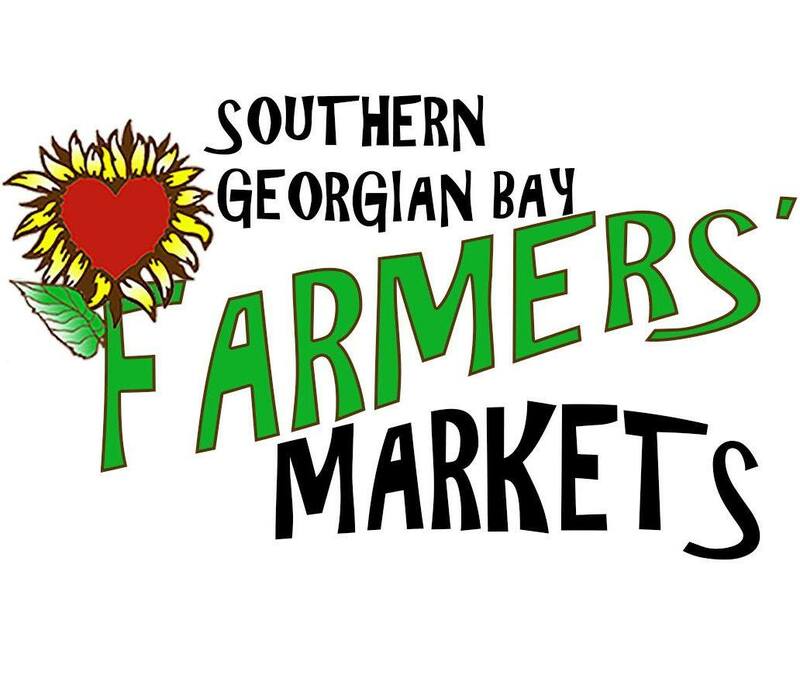 As of August 1st Tony Snyder will manage the station and welcomes all former clients. Hearty congratulations to the Toronto Dominion Bank on its 100th birthday. Claiming a traffic survey failed to show they were warranted , Ontario Department of Highways has refused Midland Council permission to erect traffic lights at the King – Yonge intersection. ← Huronia Museum declines donation of SS Keewatin. 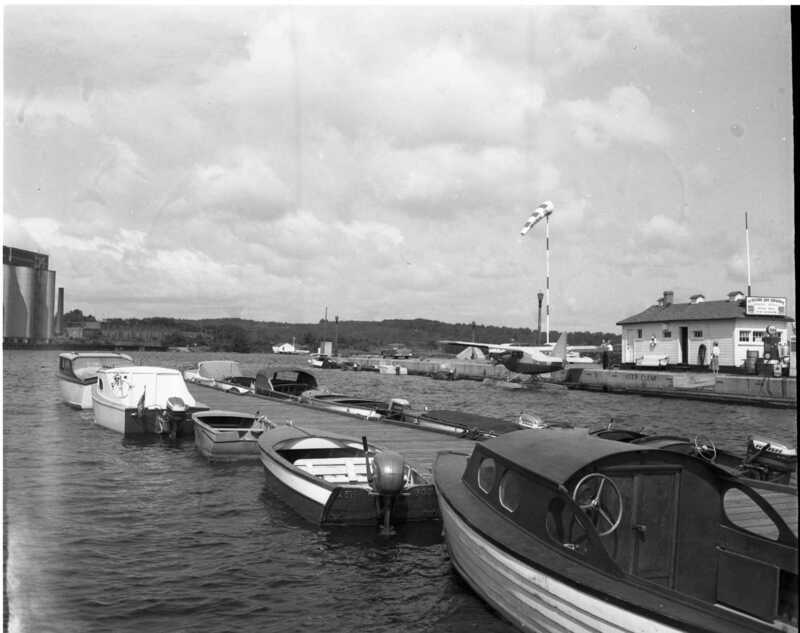 Thank’s again for some old pictures of area, look forward to seeing more.